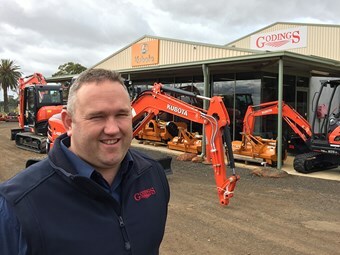 Kubota tractor, excavator and grounds care equipment dealer Godings has split from parent company Norwood and consolidated into one branch at Rockbank, Victoria, headed by new owner Adrian Williams. New Godings owner Adrian Williams. "Norwood decided in consultation with their distribution partner Kubota, that the business would be suited better to an owner operated model and presented me with an opportunity to purchase the business," Williams says. "We then consolidated the business to run out of the single branch at Rockbank, which ensured minimal disruption to our existing customers." He puts an emphasis on the fact that Godings is now locally owned and operated, and says the staff have been quite excited at the new opportunity and have happily gone across to work for him. "Most staff were offered a role," Williams says, "and the fact that I had managed the business for the last five years gave them confidence in my ability moving forward. They have also all been employed over the last few years and have seen the exciting changes at Rockbank first hand." Godings handles a wide range of agriculture and earthmoving products, including Baroness Turf equipment, which Williams says "is a new and exciting product line being distributed by Kubota Tractor Australia", Kubota excavators, SVL compact track loaders, Kubota articulated loaders, Toku breakers, EI Engineering buckets and attachments, JB hitches and attachments, Kubota tractors, Kubota compact tractors, Kubota out front mowers, Kubota zero turn mowers, Kubota utility vehicles, Kubota generators, Kubota power equipment, Baroness golf and turf equipment, Silvan spraying equipment, Berti mulchers, Landpride implements, Berends farm implements and Kanga farm implements. "The biggest seller in our excavation range is the 4.8 to 5.5-tonne Kubota ‘U Series’ zero swing cabin excavator," Williams says. "In agricultural we sell a large range of Kubota out front commercial mowers and ‘BX’ style tractors which suit our market area perfectly." That market area covers a large swathe to the west of Melbourne. On the excavator side Godings covers Geelong, Ballarat, Werribee, Hoppers Crossing, Williamstown, Altona and the entire western side of the state. The agricultural range is served to Gisborne, Sunbury, Bacchus Marsh, Riddells Creek, Romsey, Mickleham and metropolitan locations such as Werribee, Hoppers Crossing, Altona and Williamstown. Godings’ customers include plumbers, concreters, landscapers, builders, electricians, earthmoving contractors, large grounds care businesses and councils. The company also has a number of cashed-up hobby farmers and landowners as customers, who give the staff a bit of a laugh at times. "We delivered a little Kubota BX25 loader backhoe to a property and the customer called the next week and asked to trade it back in," Williams says. "When I asked the question why, his wife explained that his neighbour had purchased the same tractor the next week and he now needed to purchase a bigger one to ensure his was biggest! All for one acre!" Williams says Godings’ next phase is to further establish itself in the excavation industry and ensure that the business is meeting the needs of its customers. "We are in a consolidation phase to continue to service our existing customers while actively growing our customer base," he says. "We are in a new facility, located in the right spot and are excited about what the future holds."